Change can be a great thing, but it needs to be considered, timely and relevant to where you are at. With digital marketing standards, it’s about setting the bar higher. So, it begs the question: why have we changed our brand to SQ Digital? Make no mistake about it – it has been an interesting journey to get to where we are today. In the year 2000, SQ Digital (formerly known as SearchQuest) consisted of a computer, a bedroom, two brothers aged 21 and 23, and a student loan. After spending around a month tucked away in our bedroom office, where we on-boarded our first client, we decided to move into an office in Lancaster. We started off calling in favours from friends and family, cobbling together office supplies and furniture for our newly formed sales team, who were paid on a commission basis. At this point, Vilayte still worked part time at a local clothing shop whilst trying to get the newly formed business off the ground. He earned around £40 a week, which funded the weekly lunch bill for the workers at SQ Digital. Times were tough in the rented £60 a week office in the early 2000s. We were operating on a tiny budget and relying on our client’s fees to continue operating on a week by week basis. In those days, one missed or late cheque could have spelt the end of our business. Thankfully, our drive and determination ensured a surge of clients came on board to ease our worries. In the first four years of SQ Digital, we established ourselves as an SEO agency whilst other businesses focused solely on building websites. We found a niche in the market, as SEO was a service that was still relatively unheard of at the time. We had some household name clients on our books, as we were one of the first agencies in the UK to offer SEO. Some of those clients included Virgin, EA Sports and even the London School of Economics. Nothing gives me greater satisfaction than searching for a keyword on Google, and seeing our clients at the top of the rankings. We established our own optimisation techniques through weeks spent on research and development and focused on making it work for our clients. It became a matter of targeting results for our clients and our logo reflected this. In 2004 we made the decision to move out of our tiny offices, which had served us well. We found the perfect space, moving into another city centre location. Our expansion was helped, in part, by a council relocation grant, along with funds raised from our growing client portfolio. The move was facilitated by our need for a larger office space due to increased employee numbers, as well as the need for a professional setting to bring in an existing or potential client. With the larger office, we took the step and branched out to providing website design and development alongside SEO. We always made a point of making SEO our unique selling point: this new service made it clear we wouldn’t just build our clients a website; we’d make it search engine friendly, too. When we first started out, our dad thought we sold computers and I think he still does even today. During this 10-year period, our staff grew from 15 to 25 as we began offering more services to our wide array of clients. In 2008, the worldwide financial crisis shook the business world. Unfortunately, we saw other companies in our industry go out of business during this time, but we remained determined to continue growing our business. In delivering and then going further than our set expectations, the SQ Digital vision recognised that we couldn’t afford to stop experimenting, even in the face of a significant financial downturn that affected the entire business world. The advantage we had over other companies during this period was that we were adaptable and resilient as a business. We had to be more flexible and innovative with our ideas and services following the recession. Value-driven propositions evolved from this era and we went from strength to strength as an agency and continued to grow our client portfolio in the process. Our previous office provided the foundation of where we are today, but, at this point, we were bursting at the seams with our ever-expanding workforce. This prompted us to make the move to 76 Church Street in early 2014. The list of services we offered as an agency and staff numbers continued to grow. We were also keen on becoming more client facing as a company following our relocation. The move to Church Street provided us with offices we could be proud of showing any potential or existing clients around. By the start of 2016, our staffing totals had crossed 40 and we were one of the biggest employers in Lancaster. This obviously meant that our offices required further expansion. A chance to acquire another historical building just two doors down from our Church Street location came about, and we were pleased to make the most of it. 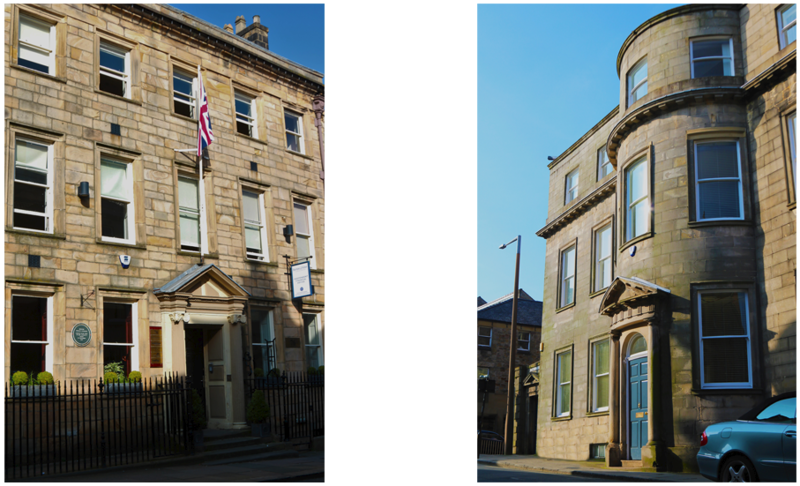 80 Church Street now plays host to our design & development team, as well as other operations personnel. For us, this is another scalable measure of our success as a company. Working from beautiful buildings like these is a measure of our success as a company. Here we are now. From those humble 2000 origins, fast forward approximately the lifetime of some of the 40+ team members running around our two Georgian era, historically listed buildings in Lancaster. With optimisation, ingenuity and evolution, look what two brothers, a dream, and a student loan, have become. That’s the heart of what is now SQ Digital: an award-winning fully established digital marketing agency. That’s why our origins (SEO and SearchQuest) and refined digital capabilities (for content, social media, paid search, PR and websites) have been brought together to forge a new identity. That is why SQ Digital and our full service digital marketing agency is a reality today. The new logo for SQ Digital represents growth for ourselves and our clients too. We have stood the test of time, and our transition from SearchQuest to SQ Digital has come at the right time. While we will always stick to our roots of SearchQuest, SQ Digital fully encompasses what we do as a company now. We do so much more than just ‘search’ here at SQ Digital, and the rebrand is key in communicating this to our existing and potential clients. Our staff have been influential in getting our company to where it is today. They’ve now allowed us to take a step back and focus on the business, rather than constantly working in it. It’s really special how all of our staff share the passion and vision we have for the company and we have people here who are willing to come up with innovative ideas and lead our company in the future. We often get questioned on why we decided to continue to operate from Lancaster, rather than make the move to one of the big cities in the north west. The answer to that one is simple; we are born and bred here in Lancaster. It’s always been our dream to stay here and build a business from the ground-up on our local patch, and that’s exactly what we have done. Here at SQ Digital, we love the fact we are giving young, capable, determined local people employment: it’s all about giving our staff a break into the fiercely competitive working world, and we take pride in offering those opportunities. We have instilled in the SQ Digital brand the value of always looking ahead and evolving with the times, if not pioneering them ourselves. We’re really excited about how we have progressed the company, and we look forward to seeing how we will to continue to do so. SQ Digital’s mantra of “Dream > Believe > Exceed” is something our company has stood by. Change will be a great thing for both our clients and the people of SQ Digital. And thanks to optimisation, infrastructure, and growth, we’ll have the next instance of change perfectly targeted as well.